Sewing is an incredibly rewarding pursuit. It’s something that can be with you for life, whether you’re a craftsperson or a thrifty soul who likes to mend things rather than throwing them away. It all comes down to having the right machine! In this guide, we’ll introduce you to our favorite sewing machines for beginners. We’ve picked a range of accessible, user-friendly options. Some are computerized models that will do nearly everything for you, and some are old-fashioned manuals which will teach you technique. There’s something here for everyone! Let’s start by meeting our Top Three! The Brother XM2701 is our least expensive pick for a new needleworker. It’s less than $125, but it’s a fully-featured sewing machine with lots of user-friendly design touches. The XM2701 has all the accessories you need to get sewing right out of the box, and it’s an accessible way into manual sewing for first-timers. It’s very inexpensive. We think this is ideal for someone who wants to try sewing without making a big commitment. Or, if you’re just a thrifty shopper, it’s a great bargain! It’s lightweight and compact. The Brother XM2701 is easy to bring to class, and it’s also convenient to pack away, for folks who don’t have a dedicated sewing space! It combines the simplicity and reliability of a manual machine with the versatility of a computerized machine! This one is completely manual, but it has 27 built-in stitches and a range of convenient automatic features. The advantages of not having a computer are several: first, there’s no computer to go wrong! A lot of cheap computerized models are quite unreliable, and simply forgoing the computer avoids the weakest link. Second, you’ll have to rely a little more on your own instincts, which teaches you better sewing technique! Thirdly and most importantly, it saves you money! While this is a manual model, it has so many built-in stitches that it’s comparable to any computerized model around this price range. There are lots of decorative options, as well as classic “workhorse” stitches. You also get an easy one-step buttonhole feature. That’s not an uncommon feature to find on most machines these days, but it’s still super handy for beginners. Even most advanced needleworkers don’t do buttonholes manually anymore. You can also adjust the size of the buttonhole, which is a bonus over comparable models. All the stitches are displayed right on the front of the machine, with graphic diagrams. They’re all selectable via a handy dial. There’s no need to consult a manual or scroll through computer menus to find what you’re after! It’s super easy for beginners to go through and try a little bit of each to become familiar with the machine. It also has a built-in free arm to help you work on cuffs, sleeves, and pant legs. Having so many convenient built-in stitch patterns, plus the free arm and the buttonholer, feature makes the XM2701 about as versatile as an entry-level computerized model. To thread your needle, you just pull a lever on the side of the machine. No fiddling necessary! To load the bobbin, you just drop it into place, rather than fumbling with an old-fashioned drawer that you can’t see. That cuts out two of the most frustrating parts of sewing for newcomers! With the Brother, you can get right to the fun part! There’s also an automatic bobbin-winder, which takes only two steps to get going. It has a nice, bright LED work light. We prefer LED’s these days because they put out the most light, and they last the longest of common bulb types. It has a variable-speed foot pedal. The harder you press, the faster you’ll go! It’s very simple, and there are no complicated speed adjustment settings to familiarize yourself with. It comes with 6 feet in the box. They’re all easy snap-on components, so there’s no skill required to switch between them. It comes with an instructional DVD that’s quite comprehensive. All the videos are also available online for free. They’re fast-paced, but they cover all the basics and introduce you to all the key aspects of the machine. Overall, this is a very easy model to learn on. The video instruction covers everything we’d include in a first-time curriculum, and the machine is well-marked and intuitive. It’s popular for kids as well as adults. We think that as long as you watch the video up front and take the time to learn the names and functions of each part, you can get going in under an hour. Even though it’s small and light, it’s surprisingly powerful. It can tackle denim relatively easily, as long as you go slowly and use the proper needle. It doesn’t jam easily, and although it’s light, it won’t shift around. The XM2701 is covered by a 25-year warranty and free lifetime technical support over the phone or web. It doesn’t have any computer to help you out. If you want to learn proper technique without too many shortcuts, but still like a few modern amenities, this is ideal. It’s takes less effort to use than something even more manual, like a Janome. However, it does pose more of a learning curve than a computerized system. It isn’t the sturdiest machine on the market. It’s mostly made from plastic, as you’d expect at this price. So, you do sacrifice build quality somewhat when you save money. This is an excellent first machine, but it probably won’t last a lifetime. You may want an extra lamp for large projects if you work at night. The LED bulb is bright, but doesn’t have super wide coverage. The foot is a bit jumpy, like most inexpensive models. It goes either very slow or very fast, and it’s hard to find anything in between. We think it’s a small detail to be worried about. You won’t find anything better unless you want to spend $75-$100 more. It’s good on some heavy materials, but it’s not as sturdy or smooth as more expensive/more powerful models. That’s mainly due to the light build. It gets thrown off-kilter more easily, and doesn’t have the steadiness that comes with a heavier, more powerful system. Brother’s quality control isn’t particularly good, and that’s certainly the case with this model. Occasional buyers end up with lemons. Make sure you inspect and test the machine you receive within the return window. Warranty service also has to be done by an authorized dealer/repair shop, so make sure there’s one in your area before buying! Or, add on a warranty plan from a third party like Square Trade to avoid the whole issue. Brother’s tension is factory-set, and you can’t make easy adjustments the way you can on a Janome. Most people don’t have issues, but if you get one that’s wonky from the factory, it’s easiest to just exchange it. One other downside of the light build: it’s loud. If you’re a beginner who wants to get right to the business of creating, and wants to skip over most of the learning curve, this Brother is an excellent option. It’s fully-computerized, and makes starting to sew infinitely easier than a traditional machine would. The HC1850 has more than a hundred stitches built in, plus the power and workspace to tackle a whole range of projects. It’s more powerful than the XM2701, and a lot more versatile as well. We recommend it to newcomers who want lots of convenience and computer assistance. It’s fully computerized! The Brother HC1850 has a big, bright LCD display which shows your stitch selections, and any adjustments you make to the length or width. That makes it easy to check that you’re doing exactly what you want to be doing as you work! The computer system takes almost all of the “work” out of starting to sew. You’ll still have to learn your way around the machine and become confident with needlework, but all those tedious bits like adjusting the tension aren’t part of the equation. This machine is great at adjusting its own tension, and keeping things moving smoothly. It has 4x the built-in stitches that you get on the XM2701! There are 130 in total. They range from basic utility and basting stitches to decorative patterns and an entire monogramming font. That’s more options than most beginners will even touch for a month or so, so you’ve got plenty of variety to grow into! Monogramming can be one of the most satisfying things to do on a sewing machine, and this one makes it extremely easy to do from the get-go. You’ll also have 8x as many buttonhole options! The HC1850 has 8 different styles to choose from, and they’re all achievable in one step. With so many pre-programmed stitches, you’d think there wouldn’t be any room on the machine for diagrams. Brother have very smartly built a flip-down chart of all the stitches onto the front of the machine, so you can easily scan through them all! It’s unobtrusive and space-saving. One of the biggest advantages the HC1850 has over the cheaper XM2701 is an adjustable speed feature! With the cheaper model, you’re relying on a rather imprecise foot pedal to control speed. On this one, you can use a slider right on the body to speed things up or slow them down. The pedal will change its top speed proportionally to your selection. That might seem like a luxury feature, but if you want to be able to start super slow and work up, it’s a good investment. This is a good model for anyone who’s been overwhelmed by a too-fast foot pedal previously. Another huge advantage is the ability to adjust the length and width of all your stitches. This computerized machine lets you tweak any of the preset stitches to the dimensions that suit your project! It’s much better than the XM2701 for quilting, if that’s where you see yourself heading!It comes with a wide extension table right out of the box, and it has 14 dedicated quilting stitches built in. The table has adjustable feet so that you can get an even surface even using it on an imperfect desk! You can also drop the feed dogs for free-motion quilting! The HC1850 is slightly better than the XM2701 on heavier materials, even if it’s not a heavy-duty machine per se. It has a higher top speed, and the added bit of weight makes this one a smoother ride over layered flannel or denim. You shouldn’t feel restricted at all in terms of what kinds of materials you can try on this machine! As with the XM2701, the HC1850 has an automatic needle-threader and a quick-set bobbin loader for convenience. They’re exactly the same features, and they’re just as easy to use on this model. The HC1850 is a more elaborate machine than the XM2701 by any measure, but it’s still intuitive and user-friendly. We don’t think a novice will have any trouble figuring it out. The computer controls are very simple, and the manual/instruction materials are clear and thorough. Although it’s certainly larger than the XM2701, the HC1850 is still very light and manageable. It’s only about 10 pounds all told. You can easily bring it to class or pack it away, although you’d want to buy a case separately. As with the other Brother, this model comes with a helpful bilingual user manual, instructional DVD, and a 25-year warranty (along with the lifetime phone support). Given that it’s a computerized model, we’re also pleased to see that it’s actually the more reliable of the two as well! Even though this is a very well-equipped, computerized model, it’s not quite as versatile as more expensive computerized options. You can’t adjust the font size, for one thing. So, while this machine certainly gives you room to grow, you’ll probably want to buy something even more versatile eventually. It costs ~$75 more than the XM2701, but isn’t built much more sturdily. It has a better than average reliability record for its price range, but it won’t last as long as a comparable Janome like the one we’ve recommend below. Some of the smaller plastic parts like the automatic needle threader lever break relatively easily. This isn’t something that will hold up to intense, daily use. It’s a learner’s machine, or something for the occasional seamstress. You should be careful with it, and make sure you’ve read the manual thoroughly before you start using it. As we said of the cheaper Brother, this one probably won’t be the last sewing machine you buy, but it makes a good first. The main issue as far as reliability and durability is (typically for Brother) quality control. The vast majority of these units are close to flawless, but the occasional lemon does turn up. We recommend that you be sure to inspect and test your unit before your return window is up! You don’t want to get stuck with a lemon. At first glance, you might be puzzled to see that the machine we’ve recommended as our top choice actually has the least features. Well, bear with us! The Janome 2212 has the fewest stitch options, and the fewest extra amenities. On the other hand, it’s the most reliable entry-level machine we’ve reviewed to date. This one might be a bit old-fashioned compared to the Brother’s, but it’s much sturdier and will last you much longer. And because it’s old-school, it’s the best bet for teaching you proper sewing technique and a needleworker’s intuition. So, in short, you’ll have a bigger learning curve with this model, but when you eventually graduate from it, you’ll be a much better needleworker than someone who started on one of the Brother’s! This one has a serious track record behind it. The 2212 is a staple in costume shops, home ec classrooms, and other places where sturdiness and simplicity count the most. While you may eventually find that you want something with more features, we don’t think you’ll ever be driven to a new machine because your Janome didn’t work properly or broke. It’s a real workhorse that has its reputation for good reason! It’s an all-manual sewing machine. In that sense it’s a lot like the Brother XM2701. The Janome is even more old-school, though. It has almost no automatic features, and it’s dead simple to use. We think it’s the ideal machine for a beginner who wants to learn the good old-fashioned way! The first big advantage of having an all-manual machine is that you only have to learn the functions of each component, not how the computer works. The second advantage is that this (even more than the XM2701) is going to make you a skilled, knowledgeable stitcher. You’ll learn how to manually adjust tension, problem-solve bobbin and needle alignment issues, and achieve your project goals without shortcuts! In short, by learning on the Janome, you’ll develop the kind of intuition that a needleworker who works without computer assistance has. You’ll need to practice more up front, and have a bit more patience, but this is the best way to become truly skillful at sewing. It’s lightweight and compact. The 2212 is heavier than the Brother’s, but it’s still very manageable to take to sewing class or to a quilting group. You’ll also find that it’s easy to get in and out of storage if you don’t have dedicated workspace. Unlike with the Brother’s, you’re not sacrificing much in the way of build quality. One way to see the difference in stark terms is to compare the weights: this is a good 50% heavier than either Brother. It’s still under 15 pounds, but it feels much less rickety or light. The Janome has a metal frame, all-metal feet, and sturdier plastic components than you’ll find on the Brother’s. It’s a heavy-duty machine that could last for years, even if it might lack elaborate features. 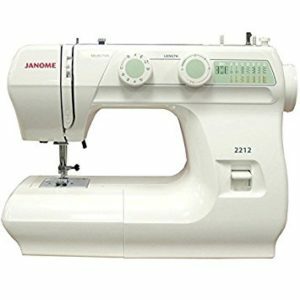 Janome’s have the best reliability on the market as far as we’re concerned, and the 2212 is no exception. You’ll get a lot more mileage out of one of these than you would from a Brother. The Janome’s reliability is just as compelling as the Brothers’ versatility in our opinion. While those machines get you started quickly and give you lots of options, they can also develop problems. That’ll leave you just as frustrated as if you were struggling to thread a needle, if not more. So, as long as you’re prepared to learn the old-school way, we think this is the better choice overall for beginners. There are 12 built-in stitches. They’re all diagrammed on the outside of the machine, and a handy dial selects stitches for you, just like on the Brother. You can adjust the stitch widths and lengths, even though you don’t have a computer to do it for you. That’s via knobs on the body of the machine. They’re clearly marked and simple to use, even if you’ve never used a sewing machine before. There’s also a simplified buttonhole feature. It has four steps as opposed to the one-step Brother buttonhole features, but again, you’ll get more out of it in the long run by learning how each step works. As with our other picks, the 2212 has a free-arm for cylindrical sewing, and you can drop the feed dogs for free-motion projects. The pedal is much more finessed than those that come with the Brother models. It’s still more sensitive and jittery than the ones that come with more expensive Janome’s, but it’s above average for entry-level models. Since it’s heavier than the Brother’s, it moves through heavier workpieces more smoothly and consistently. You can easily go through 5+ layers with no issues at all. It also has incredibly consistent stitches for the price. As long as you read the manual and follow the troubleshooting instructions, this one’s easy to keep running smoothly and neatly for the long haul. That’s where manual tension adjustment can actually work in your favor! You’ll have to spend some time learning how to find the right balance for your thread, but when you run into issues, you can easily resolve them. You don’t have to go to a dealer like you would with the Brother’s. This is a completely manual machine. As we’ve said, that’s a good thing in that it will teach you technique and give you more skills than you’d get if you started with a computerized, easier model. Just be prepared to give yourself time to learn, and be aware that you’ll need more practice time with this machine before you can really jump into creating projects. It’s expensive for the amount of features that you get. We think the Janome’s superb build quality justifies the cost, but it may be counterintuitive to some people to pay more for less compared with one of the Brother’s. It has an old-fashioned light. Both Brother models have bright LED’s, and we prefer LED’s overall because they’re both brighter and longer-lasting. You can swap out the bulb in the Janome for an LED, but it has an incandescent bulb out of the box. It doesn’t have much workspace for big quilting projects, although you could certainly piece along on this one. If you want to quilt, you’ll want to find a good extension table to use with the Janome. In keeping with the old-school theme, the Janome has a traditional side-loading bobbin tray instead of the simple drop-in system on the Brother’s. It’s a bit harder to maneuver at first. After you get used to it, you’ll be fine. You have to move the needle up and down manually. There’s no button to help you out. There’s also no automatic threader. Get ready to perfect your manual technique! Don’t worry, though. You definitely want to be able to do this yourself, because even the best automatic threaders don’t always do the trick. As always, we checked out a lot of other reviews online to see how our impressions of the Janome. While most agree with us that it’s a superb sewing machine, some people ran into trouble with broken parts or components not working properly. We obviously can’t tell every negative reviewer’s exact circumstances, but the problems described in the few poor reviews seem like user error 99% of the time. If you don’t know what you’re doing, you should never force a sewing machine. Go to a class and have the instructor help you out, or go online and consult the wealth of helpful advice for this and other models! Now that we’ve gotten to know all our recommendations in detail, which should you buy? 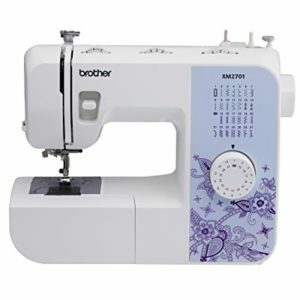 The Brother XM2701 is our recommendation to anyone who wants to start sewing with as small an investment as possible. It’s more reliable and well-equipped than other models in its price bracket. It’s also about as user-friendly as manual machines get. Just beware the inconsistent quality control, and be advised that most people will eventually grow out of this machine. 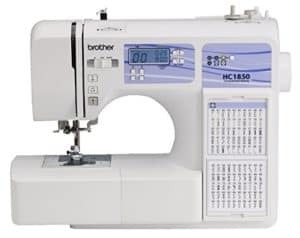 The Brother HC1850 is our recommendation to people who want to jump into garment creation and quilting (as well as other projects) with as little a learning curve as possible. Of our three picks, it requires the least technique, practice, or instruction to use. It’s full of features, and extremely convenient to use. The downside is the quality control and the rather light build quality. This one won’t last nearly as long as a Janome, even if you avoid the lemons. It should last you through your novice phase very easily, though! The Janome 2212 is our favorite of the three, even though we’re aware that old-school machines like it aren’t the flavor of the market right now. It’s simple and has very few extra features, but everything works perfectly and will continue to do so for years of use. It’s sturdy, reliable, and an excellent workhorse. Even if you eventually get a more elaborate machine, you’ll probably end up keeping this one around–it’s that good. On the downside, it will require the most practice, patience, and technique to use. You’d come out the other side a better needleworker, but we know a lot of people aren’t interested in putting in the time and energy up front to do things completely manually. We recommended a cheaper computerized model in our Top Three picks for beginners. The Brother is a great little machine, and we think it’s the best “accessible” model for beginners. It offers a versatile computerized experience without breaking the bank. If you’re absolutely sure you want to stick with sewing, and want our ultimate recommendation, it’s a more expensive computerized machine. Janome’s Magnolia series is one of our all-time favorites for any type of sewing, even for experienced users like ourselves. This 7330 model is the computerized Magnolia. It doesn’t have nearly as many stitches onboard as the Brother HC1850. It’s also $200 more expensive. Why do we prefer it? 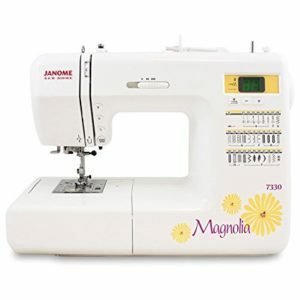 Just as the Janome 2212 is wildly more sturdy and reliable than the Brother’s in our Top Three, so too is the Magnolia. This is a computerized machine with a near-flawless reliability record. That’s a rare thing in today’s market! The Magnolia is as sturdy as the 2212, but adds some more creature comforts. It has lots of one-step buttonholes onboard, and a special sensor attachment that measures and adjusts automatically for each project. You can also set your preferred needle up/down positions, and then the machine will use them automatically between stitches! This one allows push-button stitching, precise speed adjustment, and everything else you want in a good computerized system. It’s the most expensive model we’d recommend to a first-time needleworker, but if you know you’re in it for the long haul, this machine will be too! We think the sewing machines we’ve picked for this guide are excellent choices for beginners. They’re user-friendly, budget-friendly, and well-equipped. These models are all quite different, though. Each beginner will be ideally suited to a different one! We’ve put together this short buying guide to help you figure out which of our picks is the best one for you! Have a read through it, and then take some time to think about which model best fits your own personal criteria. The first thing any prospective sewing enthusiast should do is nail down exactly what you’re interested in learning how to do! The more you can get a clear picture of your goals in your head before you buy, the better chance you’ll end up with a machine that helps you with all your projects. Think about whether you’re getting into sewing to repair and resize things, or to create your own projects. Are you interested in quilting? Garment projects? Remember to be realistic–this is your first machine, after all. You should still try to find something that will give you a taste of all the types of sewing you want to do, though! All of our beginner recommendations are good for most types of sewing, but some are better than others for specialized tasks like quilting. You can learn more about the individual features and specialities of each recommendation in its review! After you’ve figured out exactly what you want to achieve with your first machine, consider your budget. How much do you want to spend on your first sewing machine? Are you sure you’re in it for the long haul? If so, it may be a good idea to spend a little more for something that will last you a long time and give you plenty of room to grow. If you’re not sure sewing is for you, go for something more affordable, so that you’re not making too big a commitment. Our main three recommendations in this guide all cost less than $200. In general, we think beginners should aim to spend between $100 and $200. If you’re absolutely sure that sewing will be something you stick with for years, you might consider spending as much as $400 or so. That could also be a reasonable amount to spend if you have an ample budget. Machines closer to $400 will last longer and work better than anything half the price. We’ve included one extra pick for people who want to/can afford to spend that much. The key to having a good first experience with sewing is to buy a machine with user-friendly features. Unless you’re prepared to go old-school and do everything manually, you should find a machine that makes your life easier. For most folks, the ideal beginner’s sewing machine poses the smallest learning curve to starting your actual projects. So, look for things like simplified bobbin-loading mechanisms, automatic threading features, and so forth to minimize the amount of fiddling and menial practice you have to do before you can actually sew. Even if you’re looking at a completely manual machine, you should still try and make your life easier. Things like snap-on feet, built-in thread cutters, and simplified adjustment panels make your first sewing experiences much more enjoyable, and they aren’t going to prevent you from learning good sewing technique. Regardless of whether you go with a computerized or manual sewing machine, your first workstation should be simple. Of course, all new needleworkers want to jump right in and do the fun, fancy projects. However, the more complicated and elaborate your sewing machine is, the more time and energy you’ll need to put in up front to become familiar with it. So, don’t skimp on features, but make sure you keep it simple! On computerized models, look for simplified menus which allow you to get to what you want faster. You don’t want to be overwhelmed by a motherboard that’s supposed to make things easier for you. If you’re going to be going with a manual machine, look for something with simple, clearly-marked adjustment knobs, legible stitch diagrams, and instructional markings on the frame. These last will tell you things like how to thread the machine, release the foot catch, and so forth. They might seem unnecessary, but every time you can figure things out without going back to your manual saves you time and frustration. The key decision to make, as with any sewing machine you buy these days, is to choose between manual and computerized machines. When you’re starting out, you won’t have a clear idea as to what you really prefer to work with. After all, you’re getting into sewing for the first time! In your case, it comes down to a question of philosophy. If you want to become a really skilled needleworker, who knows their way around technique and troubleshooting to a T, you should go manual. You’ll face a steeper learning curve up front, to be sure. You’ll come away with much better technique, problem-solving abilities, and instincts, though. And if you eventually decide you want the additional convenience of a computerized machine, you’ll be in a much better place to make manual tweaks and fixes if the computer doesn’t do exactly what you want. If you want to get right to producing great results, and don’t mind taking some shortcuts to get there, get a computerized model. They have the least learning curve between sitting down at the machine and actually sewing. Plus, they have a wealth of fun features and patterns that can keep you interested and engaged. The only downside of a computerized model is that you won’t spend much time getting to know the mechanical process of using a sewing machine. You’ll probably need to take yours into a shop to be serviced, because you won’t have a good sense of how to tweak the tension settings. You may also find yourself limited to the preset features in your machine’s computers, since you don’t have much manual training up front. Both types of machine are totally valid. They’re both capable of producing great results, and providing you with a fulfilling first sewing experience. Go for whatever feels more “you” at this point, and remember you can always switch to the other type if you stick with sewing and eventually upgrade! P.S. Don’t worry too much if your new machine doesn’t come with elaborate training materials. You can always sign up for a sewing class. That’s typically the best way to learn, since the instructor can point things out to you and make corrections that you might not necessarily notice if you’re learning from a video. Having said that, online tutorials are better than ever, and Youtube is always a good place to find helpful info and technique advice! Finally, while we’ve chosen models that have above-average reliability, entry-level sewing machines are not as reliable overall as more expensive models. As with so many things in this world, you do get what you pay for to some extent. That’s why the warranty on your machine is going to be especially important. Before you buy, make sure you understand the terms of your machine’s warranty. In many cases, manufacturers will require that you get any necessary maintenance or repairs done at an authorized service center. Check to see if any of the major companies have a facility or have licensed a shop near you. That’s good to know up front. Otherwise, you could end up having to box up and ship your machine back to the company. In many cases, that’ll be on your dollar. If it looks like there aren’t any authorized service centers near you, we suggest getting a third-party warranty at the checkout. If you get one of these policies from a company like Square Trade, you can often avoid having to deal with the manufacturer at all. Instead, the warranty company will take care of you and help you get a replacement without all the hassle. The other key thing is to make sure you buy from an authorized dealer. Sewing machines generally have very long warranty policies from the manufacturer, but they’ll be nullified if you buy your machine from an unauthorized reseller. Check that your Amazon, web, or sewing store vendor is certified and approved by the manufacturer before you buy! Lastly, we’ve found that the beginners’ sewing machines we’ve recommended, as well as many others in this price range, are actually quite reliable. Their problem is quality control. So, while the vast majority of units work perfectly, some lemons are nightmares. That’s why we suggest making a careful inspection of your new machine as soon as you get it. Check that all the parts and accessories are in the box. Take the machine for a basic test drive within the first few days. You want to be sure you’ve spotted any obvious quality control issues before the return window is up! That way you can avoid being stuck with return shipping costs or dealing with confusing manufacturer policies. And one final thing: we wouldn’t recommend any of these sewing machines to you if we weren’t absolutely sure they’re the best on the market for newcomers. We say all this about warranties and reliability to make you a savvy buyer, not to scare you off! These are by far the most reliable entry-level options. Just be sure to cover all your bases, as you would with any large purchase. If one of our beginners’ picks seems right up your alley, great! Click on one of the links in our review to see all the relevant details. If you’re still browsing for your ideal first machine, that’s fine as well! You might consider going with one of our overall recommendations on our homepage. There are several options there that would make excellent first machines.